Music, dancing, the king’s rider and the Manor Court – we had it all at this year’s Charter Day on Saturday 2nd March 2019. So what’s it all about? 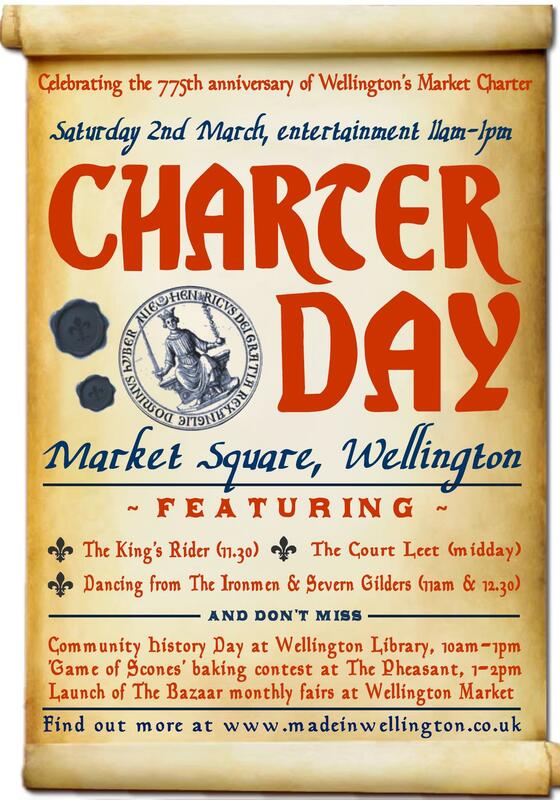 Well, on February 29th 1244, King Henry III signed Wellington’s first market charter. It was amongst the earliest awarded to a Shropshire town and, as a town that still boasts one of the biggest and busiest markets in the county eight centuries later, it’s an occasion worth marking. So, the first Saturday of March each year is celebrated as Charter Day. 13.00: Bakers go into battle in our ‘Game of Scones’ at The Pheasant Brewhouse, adjudicated by the Ale Taster. All entries to be submitted by midday. 14.00: Judges announce their verdict! THE NEXT CHARTER DAY WILL TAKE PLACE ON SATURDAY 7TH MARCH 2020. It all adds a bit of colour to what can be a cold and grey time of year, and it’s another reminder of Wellington’s long history as a market town. Wrekin Local Studies Forum have reluctantly decided to cancel the Community History Day at Wellington Library on Saturday 3rd March due to weather forecast of more snow and ice.